TwH‘s NBA preview continues with a look at the Southeast Division; or, the Miami Heat and a group of allegedly professional basketball teams. Also featuring the ballad of the Charlotte Horncats. 2013-’14 Linchpin: G Dwyane Wade. As has always been the case, Wade has to consistently be the primary backcourt scoring option for the Heat system to work. He is the catalyst, and his driving and playmaking abilities create opportunities for LeBron exploitation and Chris Bosh’s work on the glass. 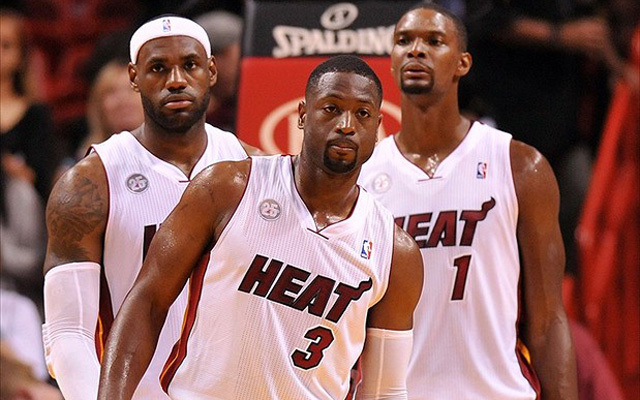 When he suffers from injuries, the Heat suffers as a team. A recent revelation that his 2002 knee surgery while at Marquette has led to problems later in Wade’s career speaks to the delicate nature of his legs. He will turn 32 in January, with some of the spark already gone from the game of the man they call “Flash.” His excellence is increasingly fleeting, and though any team would love to have a player of his caliber in its rotation, even at this stage, signs of wear are showing. Questions will linger throughout the season, however, and Erik Spoelstra may very well limit Wade’s minutes, Spurs-style, in order to keep him fresh come April. If he, Chris Bosh and LeBron James can remain fully healthy for the duration of the Heat’s inevitable playoff run, there is no reason to think anyone can stop the two-time defending champions. Overall: Any team with LeBron James on it is an instant title contender. Just look at the pre-Decision Cavaliers. Any team with LeBron James and two other All-Stars on it is an instant title favorite. The Miami Heat go into this season the way it went into the last: with a target on its back and a gunslinger’s mentality to prove that it is still the best out there. If not for a Frank Vogel error, the Super Saiyan powers of headbandless LeBron, the most important made shot of Ray Allen’s career and the most important miss of Tim Duncan’s career, however, the Heat may very well have been heading into this season far more hungry for another championship. One of the major non-health-related issues of this team may be its willingness to rest on its laurels. LeBron may eventually suffer criticisms of not having a consistently killer instinct like MJ or Kobe, who are both psychopathic but will never be accused of taking it easy during any minute of any game. Many fans hold Dwyane Wade in contempt for allegedly flopping for calls, which is not entirely untrue. Chris Bosh is a joker in the deck with a strange penchant for playing good soldier. Still, no one ever said these guys were ignorant in matters relating to the court. Each of their contracts has a player option at the end of this season, meaning they all have the ability to opt out and test free agency. That makes it infinitely important that they three-peat as a cohesive unit, lest LeBron return to Cleveland to play with a younger All-Star for a shot at hometown redemption. The retention of Allen and Rashard Lewis, as well as the continued development of Norris Cole, will play into what the Heat can do to stretch the floor beyond its core, but make no mistake: barring catastrophic and unexpected implosion, if they play together, they win together. 2013-’14 Linchpin: G Jeff Teague. On a team that was second in the league in assists per game last year, Teague was the leader, with 7.2 per game. In Josh Smith’s absence, he will have to adapt to the chugging play of Paul Millsap, who is less explosive but will be a perfectly acceptable replacement. Teague will have to up his scoring to account for some of the load, and though he is a more than capable free throw shooter (88% last season), improvement on the 36% he shot from distance last year would be welcome for a Hawks team that, Kyle Korver aside, was not impressive in that area. If Teague can increase both his assists and scoring, even marginally and at the expense of other players’ stats, it will have a tremendous impact. Overall: Failing to land both Chris Paul and Dwight Howard was one of the great misfortunes of the NBA offseason. 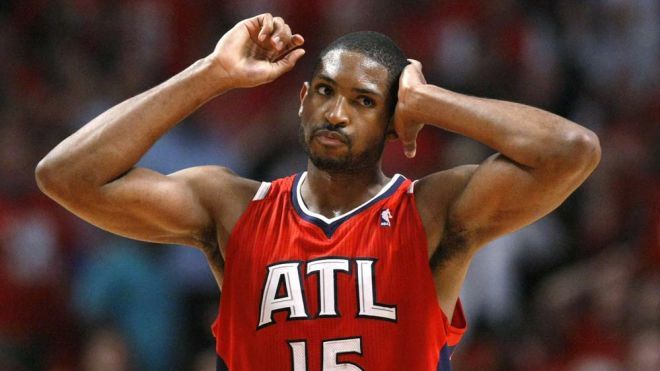 The Hawks are still a dangerous squad that can sneak up on any of the heavyweights in the Eastern Conference. The move for Millsap was necessary, and his presence will be key in the paint and on the boards. The well-traveled Elton Brand misfired with the Mavericks last season, but it was only his first year below double-digit scoring, and being surrounded by better pieces in a new environment might help him reclaim some of what he lost. At the very least, he should be able to up his averages of 7.2 PPG and 6 RPG from a year ago, and Teague’s play will encourage that. German guard Dennis Schröder will be an interesting fit as well; at only 20 years of age but with three years of professional experience already from playing in Germany, his development will be key to the Hawks moving forward. His immediate impact is in question, however, and he would have learned more from Devin Harris than he will from Teague, but he has the talent to make a splash in this league, according to most knowledgeable people. This is an adjustment period rather than a rebuilding period for the Hawks, and they have enough firepower to contend for the playoffs. Look for the Hawks to make a near-deadline trade, possibly of the ever-popular “blockbuster” nature. 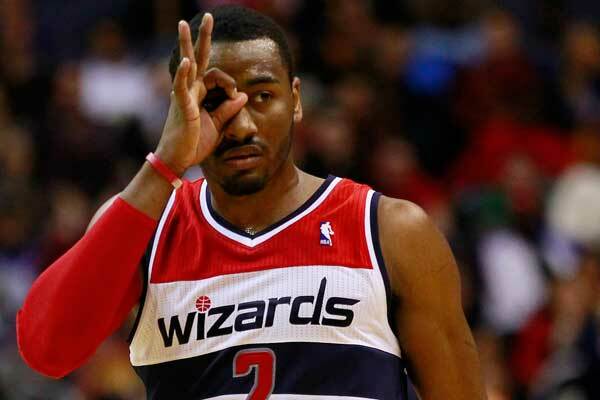 2013-’14 Linchpin: G John Wall. Coming off an injury-shorted season in which he played only 49 games, Wall signed a significant contract extension (5-years, $80 million) to stay with the Wizards, the prospect of which he is reportedly very excited. The Wizards were an exponentially better team with Wall in the lineup last year, and his 18.5 points and 7.6 assists per game averages should see a bit of an uptick this year, particularly the latter. He is one of the most explosive forces in the league and can be a game-changing element by virtue of his passing and driving abilities. Wall will dictate the tempo in Rose-like fashion, and his capable teammates will have to deliver in key moments for the Wizards to sniff the playoffs in a tightly-contested Eastern Conference. This will be his first real shot at a solid NBA season in his early prime. Drafted out of Kentucky after just one year (as so many are in this day and age), he was a young rookie learning the professional game. The second, of course, was an abnormal lockout season, and last year struck him with injuries. This will be the world’s chance to see what John Wall can really do as a close-to-fully-developed professional basketball player, and it could be a real coming out party for his game and for those benefiting from his many talents on the court. Overall: Wall’s presence need not yield any more words, but it is significant when he plays. His supporting cast this year is peculiar and could be a fascinating case study in team dynamics: for those of us who remember the Bobcats’ “Okafor in ’04” campaign, Emeka Okafor is now 31 years old, and for every year since his third season (2006-’07), his per game scoring average has decreased. His rebounding has also never been the same since he left Charlotte, and the Wizards would like to see Okafor get back to somewhere in double-double range on a more consistent basis. Another rookie from Okafor’s draft class, Josh Childress, could find himself with relatively significant minutes off the bench. Nenê will be a solid post presence, but the Wizards will need him to up his rebounding average from a year ago (6.7 RPG) to the higher end of the 7-8 range, where he was during his time in Denver and first year in Washington. Otto Porter had a great sophomore year at Georgetown, with 16.2 PPG and 7.5 RPG, and if he can carry some of that fire into his rookie year, he could have a significant impact on this roster. If all the cogs rotate in steady motion with Wall, the Wizards may be able to slip into the 8-seed, but this is really a team built for the (albeit very near) future rather than the 2013-’14 season. 2013-’14 Linchpin: G Kemba Walker. As much as Jefferson’s arrival ignited the Horncats franchise, Walker is the guy who has already begun blossoming into a fine NBA talent. He averaged 17.7 points and 5.6 assists per game in 2012-’13, playing all 82 games for the Bobcats. In fact, Walker led the team in points, assists and steals (2.0 per game) over the course of the season, utilizing his electrifying and well-rounded game to exploit defenses. Like Jefferson, he also just signed a nice three-year contract and expects the team to improve around him as he hones his craft. Whether that means the players already there improving or new personnel remains to be seen, but it will all go through Walker’s dexterous hands. Expect a tremendous year from Walker, especially if he and Al Jefferson click offensively. 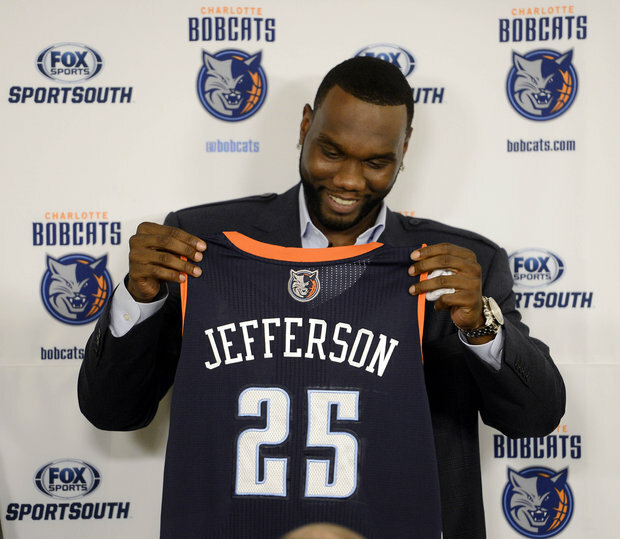 Overall: Two years removed from a historically-awful season, the Charlotte Bobcats are actually really finally maybe on the road to sustained improvement by virtue of a young core of players and one brilliantly talented player on offense in Jefferson. Owner Michael Jordan certainly intends for Jefferson to be the straw that stirs Charlotte’s colorful mixed drink, and Jefferson will open many possibilities for a team which ranked dead-last in the NBA in field goal percentage and near the bottom of the league in nearly every other offensive category. Jefferson only really improves one side of the ball, however, albeit he is an extraordinary force on that end. Defensively, the team will need Bismack Biyombo to play beyond the levels we have seen thus far in order to not yield the most points per game in the Eastern Conference again. Biyombo is almost the polar opposite of Jefferson: he lacks any offensive merit but plays very well on defense, particularly in shot-blocking and rebounding. The Bobcats will need him to drastically improve his positioning and help defense if he is to play good, significant minutes. Another fun part of this puzzle is former Sixth Man of the Year and British international player Ben Gordon, who is coming off a down year in which he tied his lowest average points per game total and had his second-worst year in 3-point percentage of his career. Gordon is in a contract year, and he will want to impress any suitors who may be examining the 30-year-old for a possible trade deadline deal. The selection of Cody Zeller in the draft came as a surprise to some, but he should bring more offensive firepower and will learn a lot under Jefferson’s leadership on that side of the floor. The Bobcats will not be contending for the playoffs this season, but they are much closer now than they could have possibly imagined when they were cheated out of lost out on Anthony Davis. 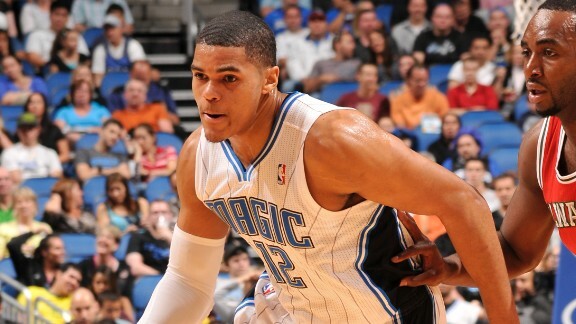 2013-’14 Linchpin: F Tobias Harris. Acquired in a trade deadline deal with Milwaukee, Harris took on the formerly-sacred number 12 upon his arrival in Florida (a move which apparently did not please the Dwightmare) and promptly led the team in points per game at 17.3. He also led the team in blocks and was second on the team in rebounding behind Nikola Vucevic, speaking to Harris’ multi-faceted game on both ends of the floor. He will be the man around which opposing teams gameplan. His strength on the boards and driving ability will open up for more creative wingplay, and his court vision will enable the flow of play to be constant in longer possessions. Expect his impact to improve a defense which allowed 101 points per game last year. Overall: The Orlando Magic are probably better off as an organization without Dwight Howard, although the level of basketball did directly suffer last season. Nothing seemed to flow, and there was no real focal point on the team. Jameer Nelson had one of his best seasons, and he will want to carry over that momentum into this season in order for his team to improve. He will also be looking to play well given the team option in his contract which awaits him at the end of the season, and he could become a viable trade piece by midseason if this ship does not get out of the harbor steadily. Beno Udrih was an extremely underrated piece of this team’s limited success last year, and his loss will be felt as Victor Oladipo develops his game. Oladipo is a magisterial talent who has all the potential to become a top shooting guard. The Magic is a great team with which to develop that talent, as the team will get to grow and learn together, likely with many defeats and general basketball adversity as the backdrop. Look for a big year from Harris and desperately wonderful play from Nelson, but do not look for the Magic in the playoffs. You will end up looking for around 2-5 years.